Zero hour or ‘Stunde Null’ is a term that refers to the era after the World War 2 (3 may 1945) and the fall of the Nazi regime. Hitler committed suicide in a bunker in Berlin and ‘zero hour’ begun it become a symbol that the war had ended. The city of Berlin had been heavily bombed, attacked by the ‘Red army and invaded by the soviets who caused havoc on what was left of the city and the people left in the city, mainly women who suffered the most. Matt Frie states the city was ‘reduced to a city of dust’ an attempted to re build Berlin started. 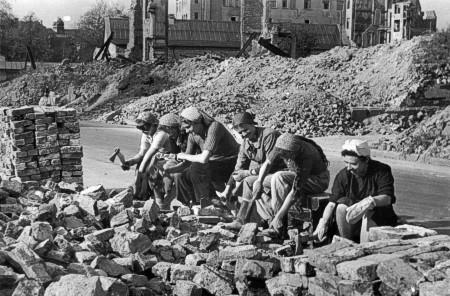 The women of Berlin started to clear away the rumble and tidy up the city the ‘rubble women’ succeed in this task. The allies decided to spilt Berlin in 4 zones, then US, British and French collaborating and created 1 unified zone against the soviet who still fought for communism. It was only in 1948 when the ‘Berlin Blockage’ was caused by the soviet barricading the people of Berlin in the city however the people of Berlin built Tegal airport and supplies from the allies were received on a vast scale daily, the blockage lasted for no longer than 318 days.